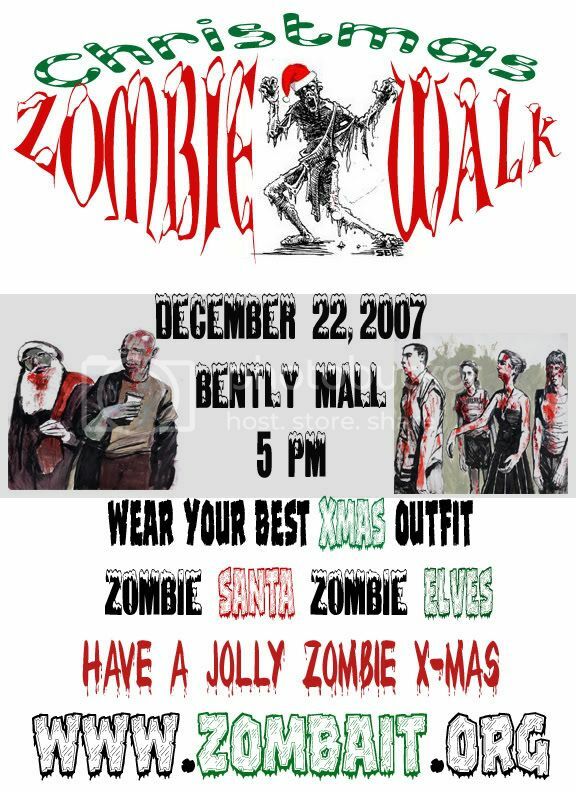 Xmas Zombie Walk! Dec 22 - Zombiewalk.com - Your source for all Zombie Walk and Zombie Flash Mob planning! Meet exactly at 5:00PM (no earlier, please). Walk exactly at 5:15PM (not a minute later). HOLIDAY WALK? WHAT'S THE DEAL WITH THAT? We'd like all zombies to be wearing something of holiday significance... whether it's a santa hat, reindeer antler headband, elf ears, a cheesy snowman sweater with blood all over it, zombie nativity characters, or whatever you can think of. Be creative! If someone would like to be zombie Santa... that would be awesome. CAN SOMEONE HELP ME WITH MY MAKEUP? Sorry, but no. We don't have time for that with this walk. SHOW UP IN COSTUME AND MAKEUP. We only have a fif**** minute period between meeting and walking. CAN I BE A ZOMBIE VICTIM ALONG THE WALK ROUTE? Yes, you can be a victim that we "attack" along the route. Drop us a line if you're interested. CAN I/MY FRIENDS TAKE PICTURES/VIDEO? PLEASE!!!! Take PICTS! Take VIDEO! Just try to get them to me! - Don't approach or touch anyone not associated with the walk (the "victim" situation will be explained just prior to the walk). - Keep your hands and feet inside the vehic... keep 'em to yourself and out of people's faces (try not to reach out directly at members of the public as we pass them at close distance... this is considered threatening behavior for some reason). - Don't scream or freak little kids out... this isn't a haunted house or freak parade. Zombie moaning/grunting/growling is totally okay, though! - NO WEAPONS WHATSOEVER. No fake ones, no real ones, no imaginary invisible ones.